Set to release on June 5, 2018, City of Bastards by Andrew Shvartz is the sequel to last year’s buzz-worthy debut novel, Royal Bastards. 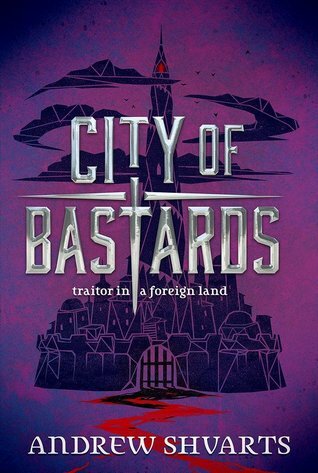 City of Bastards picks up shortly after the conclusion of Royal Bastards, once again following the actions of the illegitimate children from various nations as they navigate an increasing complex and dangerous political climate. Fans of Cassandra Clare, Sarah J. Maas, and Victoria Aveyard, as well as the hugely popular Game of Thrones, will love this adventure, and this fantasy world, which is so accessible and fun that it’s sure to appeal to readers aren’t avowed fantasy-lovers right alongside the buffs. I’ll be honest here, I judged this book by its cover. Which is stunning, by the way. Eon is also such a simply name, between that and the stunning artwork on the cover, I was intrigued. And I am certainly glad I was, because the story between covers is every bit as intriguing and exciting as the covers themselves. If you haven’t read this book in the two years since it was published, I highly recommend doing so. Despite it not being my usual “type” of book, I picked this little read up based on reviews and hype alone. I was not disappointed. From the beginning, the reader is drawn into a complex, twisted tale they just know is hiding more below the surface. Lockhart dangles the punch-line just out of reach, tantalizing the reader to keep reading, more and more and more, until the book wraps up with a twist reminiscent of Life of Pi. A group of four friends – the Liars – whse friendship turns destructive. We Were Liars is a modern, sophisticated suspense novel that keeps the reader hooked from the first page to the last, begging to know what exactly the Liars did in Summer Fifteen that damaged Cadence’s mind and forever changed the Sinclair family. Between crippling headaches and her confusion, Cadence tries to remember. The Liars won’t tell her. The other Sinclair’s won’t tell her. And Cadence seems unable to unlock the secrets trapped within her own mind; the horrifying truth that once remembered, could potentially shatter her mind, or free her. You know those books that you love to read, because no matter how many times you read them, you still love them just as much? Fire by Kristin Cashore is one of those books for me. This book came out in January of 2011 (eek- 5 years ago!). My personal copy is dog-eared, torn up and probably has a bit of water damage (from being hauled to the beach, or cottage, or camping, more than once). I’ve loved this book since the first time I’ve read it, and while its companion novels, Graceling and Bitterblue, are certainly wonderful, only Fire holds a special spot in my heart. It is not a peaceful time in the Dells. The young King Nash clings to his throne while rebel lords in the north and south build armies to unseat him. The mountains and forests are filled with spies and thieves and lawless men. Monsters, terribly beautiful creatures with the power to control the thoughts of man and beast alike, plague the land. Fire is the last remaining human monster. With a wild, irresistible appearance and hair the color of flame, she is equally hated and adored. She also has the unique ability to control minds, but she guards her power, unwilling to steal the secrets or thoughts of innocent people. Fire enjoys her quiet, routine life in the mountain range in the north of the Dells, until Prince Brigan comes to bring her to King City. The royal family needs her help to uncover the plot against the king – a plot far more complex than she, or the Royal Family themselves, could have ever imagined. Far away from home, Fire begins to realize there’s more to her power than she ever dreamed. Her power could save the kingdom. If only she weren’t afraid of becoming the monster her father was.